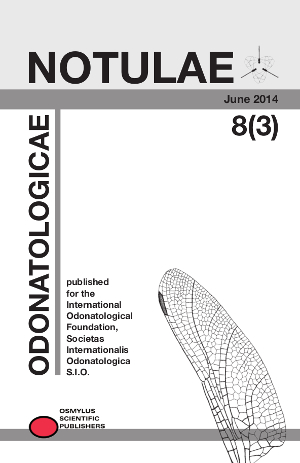 Notulae odonatologicae is a semi-annual companion publication to Odonatologica, published for the International Odonatological Foundation, Societas Internationalis Odonatologica (S.I.O.). It publishes minor original papers and short notes related to all aspects of odonatology: faunistics, taxonomy, book reviews, ethno-odonatology, etc. The Notulae are covered by most of the major abstracting services. It is general policy that submitted papers will be refereed by two members of the joint boards of Odonatologica and the Notulae odonatologicae. Style and lay-out of the manuscripts should strictly follow the published examples. This also applies to literature citations and to lists of species and references. The publication of manuscripts not prepared in accordance with the Notulae style and layout will suffer from considerable delay. Notulae odonatologicae Editorial Office, Asmus Schröter, Rasenweg 10, 37130 Gleichen, Germany. Osmylus Scientific Publishers, Odonatologica Editorial Office, Postfach 1212, 85280 Wolnzach.